Ron Marz, writer of John Carter, Warlord of Mars #10, talks with writer Marguerite Bennett about Swords of Sorrow: Red Sonja/Jungle Girl #2, both on sale August 26th! RON MARZ: I think one of the necessary aspects in a "team-up" kind of story is drawing a contrast between the main characters, and you're doing a great job of contrasting Sonja and Jana. Was that something you set out to do, or a natural consequence of the story? MARGUERITE BENNETT: Thank you kindly! I think it began as natural, and then as I worked, their balance and harmony became a theme that then became sort of the primary thesis of the story. It intensifies as it goes along-- Sonja is worldly, Jana sheltered; Sonja is flirty and confident, Jana innocent and uncertain; Sonja has a quick temper, while Jana is patient. They balance each other and bring out good qualities in one another. Jana solves problems by asking questions, but is backed up by Sonja's capacity for action, and Sonja's affection for Jana bolsters Jana's own confidence. RM: There are a number of multi-panel spreads in the issue. Did you specifically ask for those in the script, or are they something Mirka Andolfo brought to the table? MB: I am a sucker for double page spreads and splashes, unfortunately. There are always about 2 or 3 of each in my drafts, though they often get edited down. I feel like I'm always going to be a reader first, and I delighted over double page spreads as a fan. I love comics as works of art, especially when they play with the medium. There's no equivalent in novels of a double page spread or splash. In movies, the image doesn't suddenly change dimension and expand into a massive new wide-wide-widescreen. I am grateful for the artists who are so patient with my infatuation with structure. RM: Can you talk a bit about how Mirka's art fits your vision for the story? "Nothing with kings, nothing with crowns; Bring on the lovers, liars and clowns! Old situations, New complications, Nothing portentous or polite--Tragedy tomorrow, Comedy tonight!" That's what pulp is to me. RM: There's a bit of a fourth-wall breaking moment in the issue, though I won't spoil by being more specific. What prompted you to include that kind of wink to the reader? MB: It was a chance to make a joke I could never make in any other circumstance, in any other comic, or with any other company. If that opportunity was never going to pass my way again, I wanted to pounce while the pouncing was good! We're irreverent in this book. What we love, we tease. RM: Can you tease us a bit about the conclusion coming up in issue #3? MB: The third issue is our most straight-shot adventure. We've got battles and chases and mysteries in the hearts of mountains. Still fun and frolicsome as far as "the fate of every living thing on this island hangs in the balance" can be, I hope. Make sure to check out SWORDS OF SORROW: RED SONJA/JUNGLE GIRL which is now on sale, and check out the rest of the preview below. LAST CHANCE AND FINAL FINAL STRETCH GOAL FOR VAMPIRELLA KICKSTARTER! This is also your last call to support the Kickstarter or increase your pledge to secure more rewards! Click Here! At the 6th and FINAL stretch goal of $22,000, promo card set backers will receive a 6th card! This bonus will feature Joseph Michael Linsner's gorgeous cover for Vampirella: Roses for the Dead #4 and is signed in platinum ink! Thanks to the massive support from backers, the promo card set will potentially increase 50% and have all but one of the cards signed by their popular artists. Terry Dodson, Billy Tucci, Jae Lee and now Greg Hildebrandt will all be signing. The rare black and white Frank Frazetta card rounds it out for the ultimate Vampirella collectors' set. Vampirella's big 50th Gold Anniversary celebration on Kickstarter has been a big success! Fans have preordered and supported the trading cards set, secured their mega bundles of graphic novels and art books and more! To thank fans even more, Dynamite announces another stretch goal! You can still join the campaign for great values! Click Here! When the campaign passes $17,500, every fan receiving physical items will also get a 8.5" x 11" print of the stunning Joe Jusko painting used for the pack and box designs. Jusko is a legend in the industry, known for his jaw-dropping covers and perhaps most for his iconic Marvel Masterpieces trading card series. He has a long history with Vampirella, drawing countless covers in the Harris era and contributing gorgeous fully painted interior artwork for 1997's Blood Lust series with James Robinson. Jusko continues to contribute stellar covers for Vampi, such as the recent Vampirella/Dejah Thoris miniseries and the upcoming Vampirella ongoing written by his once Black Panther collaborator Christopher Priest. For passing our previous stretch goal, every backer receiving the promo card set will now have a surprise fifth card! Even better, Jae Lee will be signing all copies of this striking image. From previous stretch goals, the Terry Dodson and Billy Tucci cards will be signed as well. In addition to the Frank Frazetta and Greg Hildebrandt cards to complete the promo set. For the first time ever, the Angels meet the Bionic in the crazy 80's in Charlie's Angels/Bionic Woman, from Dynamite Entertainment. 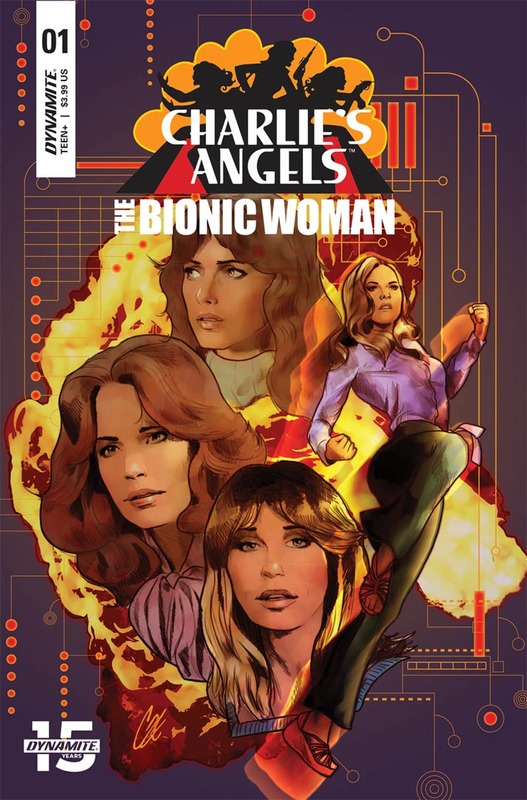 Bringing together Sony Pictures Entertainment’s Charlie’s Angels and Universal’s Bionic Woman is a first in comics and a winning crossover event in print. Charlie gives his Angels an assignment to steal back a patent for its mysterious inventor. The biggest hiccup on the mission is their toughest counterspy yet, literally - Jaime Sommers aka the Bionic Woman. Will the cyborg come out on top against a team of highly trained private investigators or will the tides turn toward a team-up against some greater threat? Audiences sat at home glued to their TVs watching the thrilling adventures of these detectives, even on the same night for a period. This new series is set within the original series continuity for both shows and takes place after their finales, bringing everyone together in the 1980s. 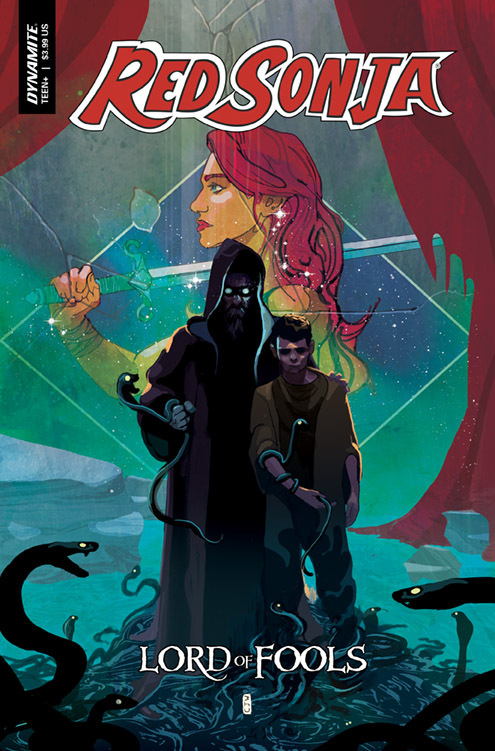 Cameron DeOrdio (Josie & the Pussycats) brings his honed writing abilities and love for both franchises to the table, while artist Soo Lee (Strange Attractors, Fight Like a Girl) draws these women in her one-of-a-kind style. Colorist Addison Duke (Barbarella/Dejah Thoris, Curse Words) and letterer Tom Napolitano (Justice League, Aquaman, Red Sonja) round out the team inside the book. On the outside, a compelling cadre of cover artists include the sensational Cat Staggs (Crosswind, Wonder Woman '77, Star Trek), indie darling Jim Mahfood (Spider-Man: Into the Spider-Verse, Tank Girl, Grrl Scouts) and paperback cover and movie poster legend Ron Lesser (The Spider). VAMPIRELLA 50TH ANNIVERSARY KICKSTARTER FUNDED; NEW STRETCH GOAL & MORE TO COME! Wow! Dynamite and Vampirella fans continue to impress! The VAMPIRELLA 50TH ANNIVERSARY DELUXE ULTRA-PREMIUM TRADING CARDS KICKSTARTER has surpassed its goal and fans will be getting the trading card set and other reward options they have chosen. Thanks to everyone who has jumped aboard. We have more exciting news! Click here to check out the campaign! Vampirella celebrates her milestone 50th Gold Anniversary in 2019! Dynamite announces a Kickstarter for the VAMPIRELLA 50TH ANNIVERSARY DELUXE ULTRA-PREMIUM TRADING CARDS. The set will feature full color art, line art, puzzle cards, signed card and thousands of sketch cards from top artists all across the iconic heroine's 50 years of history. Cards will celebrate the original Warren era with pieces from such legends as José González and Neal Adams, the Harris era with artists like Joe Jusko, Mark Texeira, and Joyce Chin, and the Dynamite era with Philip Tan and Joseph Michael Linsner, and last but not least the future with one-of-a-kind original sketches! Vampirella first appeared on newsstands in July 1969 in her own magazine released by Warren Publishing. From her very first page, Vampi became a fan favorite and soon outgrew her flirty horror anthology host role. With legendary creators Archie Goodwin, José González, Frank Frazetta, Sanjulian and more, Warren boasted the most gorgeous art of the era and boundaries pushing storytelling. Through the 90s and 2000s Harris Comics published Vampi's adventures. This era was marked by the explosions of artists like Amanda Conner and Mike Mayhew, helped by some of the industry's greatest writers such as Grant Morrison, Mark Millar, Warren Ellis, Kurt Busiek and more! Today Dynamite continues that tradition by working with top talent on critically acclaimed series like Paul Cornell, Jeremy Whitley, Nancy Collins, J. Scott Campbell, Joseph Michael Linsner and more! Plus the just announced new ongoing series by Christopher Priest and Ergün Gündüz, which will launch exactly 50 years after Vampirella's first appearance. Artists from each era are represented in the set. Vampirella is back in a new ongoing series by a blockbuster creative team, to celebrate her milestone birthday! Issue #1 will be on sale the same day and date as the iconic first magazine from 1969, and also coinciding with the first day of San Diego Comic Con's 50th convention! Following a Free Comic Book Day #0 issue shrouded in mystery, Vampirella is celebrating her big banner 50th Gold Anniversary in July 2019! And a new series is exactly what she and her fans need to celebrate this milestone! The one and only fan-favorite and critically acclaimed writer Christopher Priest (Black Panther, Deathstroke, Justice League) is bringing his trademark literary and inventive stylings to one of the most influential, beloved female characters in comic books. Don't miss the debut of his run in Vampirella FCBD #0 on Saturday May 4th! For those who still need the introduction, Priest's own historic 40 years in the comics industry is marked by achievements and milestones both on and off the page. As the first African American editor in mainstream comics, he shepherded the Spider-Man titles through an innovative period which included kickstarting the careers of legends Peter David and Kyle Baker. In the years since, Priest has written a near endless list of classic comics from Deadpool and Captain America, to Green Lantern and Conan the Barbarian, and so many more! A monumental run on Black Panther during the boundaries-pushing Marvel Knights era influenced almost every frame of the Academy Award-winning, $1 billion-grossing film. With a still running 40+ issue run on Deathstroke and other projects, Priest's legacy continues to grow! DYNAMITE'S SHEENA KICKSTARTER ENDING SOON! Not a hoax, not a dream! The J. Scott Campbell Sheena Kickstarter conclusion is just around the corner. Fans still have time to jump aboard and join the campaign. Dynamite also has some updates for existing backers and those still trying to make a decision. The next stretch goal is the J. Scott Campbell inspired Sheena enamel pin at $25,000 and we are happy to announce that we have expanded the offer so that all backers getting physically shipping rewards will be eligible to receive the bonus Sheena pin when the stretch goal is passed. That includes the graphic novels tiers. If you're interested in the pin, make sure to raise your backing level to a tier that includes it. We're excited to be able to reward the diehard fans for their help and support on this campaign! Remember that all backers of the statue itself will also be getting the bonus promo trading card. A recently added reward tier also has gorgeous Roberto Castro original art begging to enter your collection! Check out the whole campaign to see all the sweet deals! Fans supporting the Kickstarter will receive their items early, with bonuses and lower numbers in the run. To support the campaign, visit: J. Scott Campbell's Sheena! SHEENA SWINGS ONTO KICKSTARTER WITH J. SCOTT CAMPBELL STATUE! Coinciding with the Chicago Comic & Entertainment Expo 2019 (C2E2), Dynamite Entertainment launches a Kickstarter for a stunning Sheena statue based on art by superstar J. Scott Campbell. Supporters can preorder their copies of the limited-edition piece for an advance lower price, choose from a variety of extras and most importantly, help decide which variants will be produced! Support the Sheena Statue Kickstarter Here! Sculptor Steve Kiwus has masterfully brought Campbell's gorgeous cover art from Sheena Queen of the Jungle #1 to three dimensions. The high-quality resin piece is at 1/6 scale and stands approximately 10.5 inches tall with a sturdy 7.25 inches wide base. Her intricate leopard print tunic and other details are hand painted. Sheena, Queen of the Jungle is one of the most historically important characters in comic books. Predating the biggest superheroes in the business, Sheena was created by legends Will Eisner and Jerry Iger in 1937. The heroine became the flagship character of major publisher Fiction House, starring in top selling comics for over a decade with them. Including being the first heroine to have an eponymous series, beating Wonder Woman to the punch! She has continued to be published since, most recently by Dynamite in a critically acclaimed series by writers Marguerite Bennett (DC Comics Bombshells, Batwoman) and Christina Trujillo alongside artists Moritat (Harley Quinn, The Hellblazer) and Maria Laura Sanapo (Red Sonja & Vampirella Meet Betty & Veronica). Outside of comics, Sheena has starred on the small screen, silver screen and even inspired one of the most influential punk rock songs!